An American Family is starting a new life in Northern Asia where the father has the chance to built up his company. However, once they arrive they have to run for their lives from a local rebellion group who kills everyone who gets in their way. Is there any escape? When I saw that Owen Wilson would be in this movie I expected another so-and-so comedy. I was never really fond of his acting or choice of movie parts. However, I decided to give it a try and did not regret it. The movie has barely started and I got thrown into a dramatic nail biting cat and mouse game between a clueless family and a huge group of rebellions. I couldn’t turn away, my eyes were glued to the screen, hoping the Dwyer family would make it safely through this nightmare. I even caught myself yelling at the screen sometimes which doesn’t happen too often. Even though the story is simple it doesn’t need any editing because the cinematography, acting, fast pace and steady action scenes were the perfect recipe for a suspenseful thrill ride that I haven’t seen like that in years. Owen Wilson has found his genre; he is giving his best performance yet, and I hope he will stick to these type of movies from now on. Pierce Brosnan delivers as usual, even though his character was rather one dimensional and didn’t ask for much acting skills. I didn’t like the comedic dialogues that were added a few times right after something very tragic happened. Why would someone do that. Please make up you mind, thriller or comedy?! 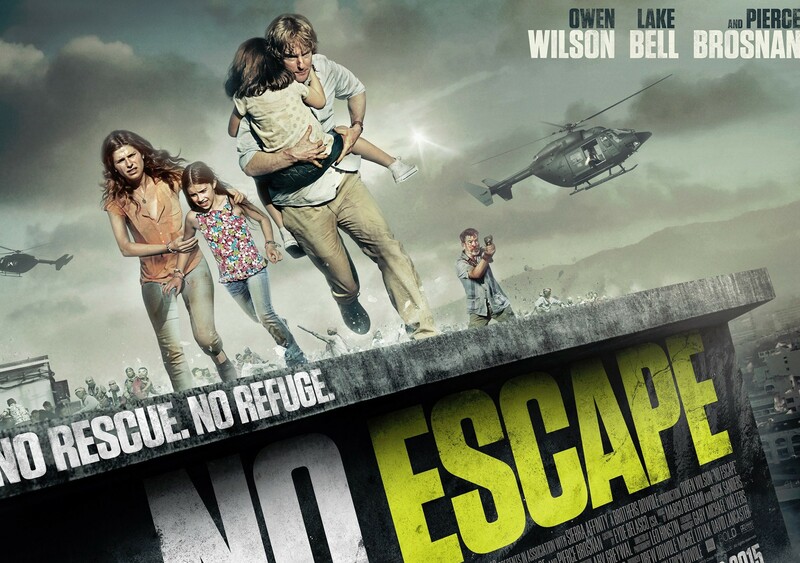 All in All, I enjoyed No Escape a lot; no dull moments, and great work all the way through. I really liked this too. Much better than expected!